I’ve been to Trinidad on two separate occasions and they couldn’t have been more different. In 2000, I was there shortly after New Year’s, within the first two weeks of the new millennium. When I returned at the end of 2003, much had changed for the worse. What was noticeable right away was the increased “hassle factor.” Granted, the second time around, I was there in the height of the high season – right between Christmas and New Year’s. The streets were packed with tourists, housing was scarce, and you couldn’t walk a single block without someone trying to sell you something. At first I wondered if I was mis-remembering how things were in Trinidad three years before. After a day or two, I knew it couldn’t have been as bad as it is now. Perhaps the government loosens its regulations for the high season and the officials look the other way when people start selling cookies in the streets, get together for an artisans market, or brazenly offer tourists “illegal” lobster in the streets. I sure as hell hope so. With the hassle factor as high as it was, I’d have a hard time recommending Trinidad again. And considering how wonderful Trinidad can be, that’s a horrible thought. 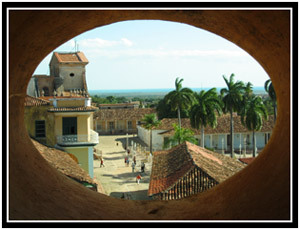 If you decide to go to Trinidad, the first thing you’ll notice about the colonial town is that it’s built on a hilltop. Near the top of the hill lies a section of town called El Centro, and it is most definitely the tourist area. Restored and newly painted buildings, La Casa de la Música, museums, and plenty of places to eat – it’s all within just a few blocks of the main plaza. In 2000, a group of us set off to hike in the foothills west of town. After walking downhill for an hour or so we found ourselves passing through banana fields and over train tracks. In time, we arrived at a sprawling, ranch-style resort (for Cubans only, I imagine) which was situated near the uncultivated tree-line at the base of the hillside. We found ourselves with an unwelcome guide, but at least he led us along a stream-side trail that opened, eventually, into a wonderful swimming hole in the middle of the jungle setting. There, beneath a huge waterfall, was a cavity deep enough to high-dive into. More impressively, behind the waterfall was a large cave into which we could swim. The water was chilly, but after a long hike, totally worth diving into. Unfortunately part of my group tried to retrace the route four years later and were stopped at the entrance to a new national park. It appears that you now have to pay to see the waterfall. There are always other options. 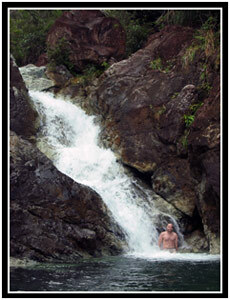 If you like hiking and waterfalls, then the Topes de Collantes are near enough to Trinidad. They’re high up in the foothills, so you’ll have to find yourself a ride to get there, but once you do there are a couple very impressive waterfalls secreted away in the jungle. If your hike is after a rain, expect to come back with muddy shoes. Also, bring your camera – you just might see the world’s smallest bird, the zunzuncito. Playa Ancón isn’t too far away from Trinidad, either, and can make for a nice day at the beach. 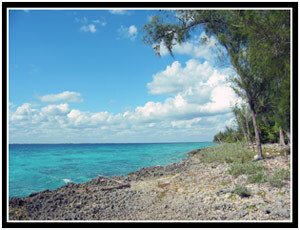 The water is warm and the waves are flat, but snorkeling is said to be better at other beaches in the area. There’s a huge resort where taxis from Trinidad ($2, one way) will drop you off and you can either sit by the bar and pool or walk yourself down the beach a ways and grab a lounge chair. You know what? Now that I think about it, there really isn’t anything outstanding about this beach. It’s just a good place to lie back, soak up some rays, and perhaps read a good book or people watch. Finally, there’s a nice bit of cultural night life to be visited in Trinidad. The center of the tourist-directed entertainment is at La Casa de la Música, just to the right of the cathedral. There’s a bar (and restaurant above, at the top of the steps) where you can sit outside, have a drink, and listen to the bands that play. If you’re feeling a little more active, you can even grab someone for a dance. The courtyard fills up fast, though, so if you’d rather sit at a table than on the cobblestone stairs, you better get there before dark. If you’re not familiar with the area, you may not realize that Playa Larga and Playa Girón are actually two different towns on the Bay of Pigs. 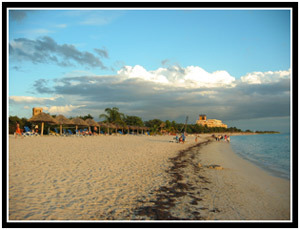 Playa Larga is situated at the end of the bay, while Playa Girón is at the mouth. Don’t believe any Cubans that try to tell you that they’re the same place or you’ll end up about 30km from your destination. The towns themselves are small and have little to offer. It’s the sights around them that are worth visiting. Both towns have decent, full-service resort hotels if you want to go that route. Common day trips from Playa Larga include a crocodile farm and the Gran Parque Natural Montemar for bird watching aficionados. I’ve been to neither, but have heard lukewarm things about both. Playa Girón, farther down the road, has a nice beach and a small museum dedicated to the Cubans’ victory over the American-backed, imperialist forces that tired to overthrow Castro in the 60s. It’s worth the 30 minutes or so it takes to see it all, I guess. The best place to visit in my opinion, though, is smack dab between the middle of these two towns. 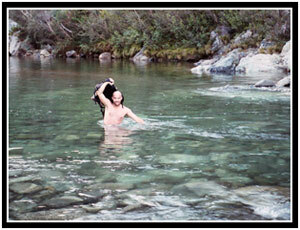 Off a deserted, two-lane blacktop, in the middle of a swampy, scrubby land, lies La Cueva de Los Peces. 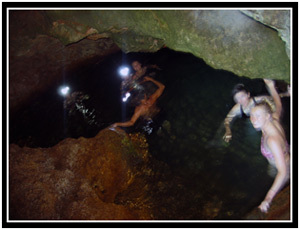 The Cave of the Fish is essentially a crack that split open in the ground about 200 meters from the shore of the Bay of Pigs. This crack, filled now with brackish water, is maybe 20 meters long by 7 meters wide… but is over 70 meters deep. Swimming up from the black depths are colorful tropical fish. Bring along a mask and you can jump right into the water with them. 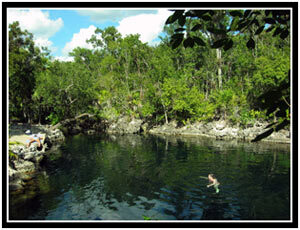 There are overhanging trees for diving and suspended boulders under which you can swim. The top layer of water is fresh and a bit colder, but if you dive about 10 feet down you’ll feel warmer as the salt layer envelopes your body. To get there, you don’t necessarily need to spend money on a cab — you can easily hitchhike to the spot. And when you’re all tuckered out, the only way you’re going to get back to town — unless you arranged for a cab to pick you up — is to wait for a passing vehicle. (You never know what you might be riding home in. A passing tourist driving a rental car? A dilapidated bus? A cattle truck?) Entry to the tiny park costs only one dollar and there’s a restaurant inside the miniature park if you get hungry. Bring a book if you want to stay awhile – there are a couple hammocks strung up right next to the natural pool. When you’re done with La Cueva de Los Peces, don’t just go back to town – step across the road and jump into the Caribbean blue waters of the Bay of Pigs. Snorkel gear is practically mandatory as the water is crystal clear and the whole area is covered with a variety of coral, amazing shells, and colorful fish. This spot, with the twin pleasures of swimming in a natural pool and in the warm waters of the Bahía de Cochinos, is probably my favorite place in all of Cuba – and seriously one of my favorite places in all the world. Baracoa is on the extreme east end of the island and if you are arriving/departing out of Havana, it might seem as though the effort of getting there is too great. It’s not. Despite the torture of an 18-hour bus ride from Trinidad, even though we arrived at 1am and had to sleep poolside at a resort because everything else was completely full, Baracoa was easily worth the effort. If you get there, plan to stay awhile. 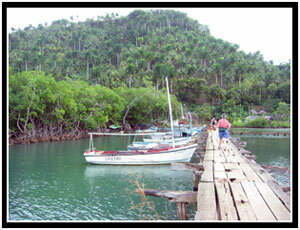 The first thing worth mentioning isn’t even Baracoa itself; it’s the road that gets you there. 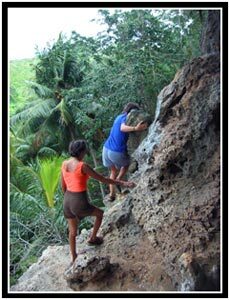 Crossing through the Sierra Maestra, La Farola, as the road is called, is a tourist attraction all its own. Try to arrange a bus ride during the day as the view is rather lacking when driving in complete darkness. 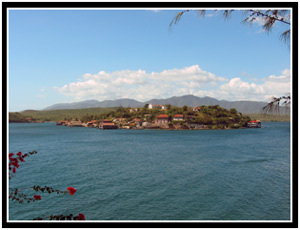 Once you get to Baracoa, you’ll notice that the town is built right up against the ocean. White waves come out of the green ocean and pound the wall protecting the Malecón. If you’re not careful on windy days, you could walk right into the spray. There’s a hotel, El Castillo, on the top of a hill in the town that has wonderful views of the ocean, the streets of Baracoa, and El Yunque, an anvil-shaped mountain to the west. To the east is a long stretch of beach and the village of Boca de Miel. Literal forests of palm trees line the hills, drawing comparisons of this part of Cuba to the South Pacific. 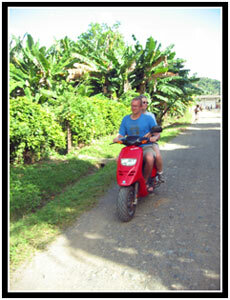 El Castillo also rents mopeds by the hour (up to a maximum of $18 a day – that’s only $9 each if you’re traveling with a partner!) While high on the obnoxious tourist scale, I still have to recommend it after experiencing a very fun, exploratory day. With or without mopeds, you might want to enter the park around El Yunque. While it doesn’t look too hard to climb the mountain, we didn’t have enough time to try it. At the end of the day, we managed to get our moped up the rocky, dirt road and into the park. We found a person willing to let us park our ride under a tree in their yard and proceeded to hike past many attractive swimming holes to locate a beautiful waterfall. Bring your swimming suit and Tevas, though, because you’re going to have to cross waist-high water to get there. The park fee can be steep — $8 per person – so make sure your wallet agrees with you before you get to the gates. The little village of Boca de Miel is also, most definitely, worth a visit. Boca de Miel is a small fishing village situated where the Río Miel meets the ocean and has a few attractions all its own. 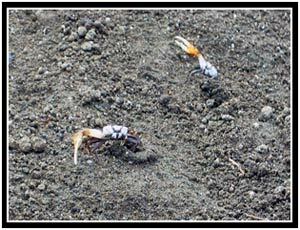 When you get there, be sure to stand still by the mud flats in front of the bridge where you can see hundreds of tiny crabs coming out of their holes and waving their little pinchers at you – a nice enough, if a weird little welcoming committee. Besides meetings some genuinely friendly people in Boca de Miel, you can hire a guide to show you the way to the “water cave.” Hustlers will likely try to get you to pay for the privilege of swimming in a room of two of the open-air cave, but friendly locals can take you there for free. The cave itself is neat enough, but the hike there is all about sightseeing. 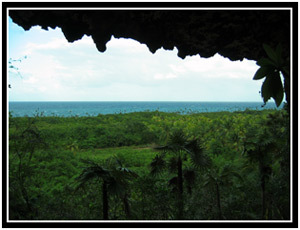 You’ll get to walk hundreds of meters along El Balcón, a cave-like shelf carved out of a cliff face some 15-20 meters up. 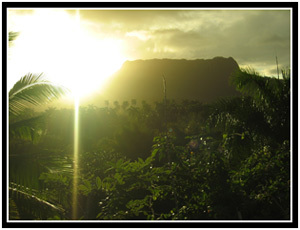 The view over the palm trees all the way to the ocean is incredible! Once down again on flat ground, you walk along an elevated path of limestone rocks – apparently build hundreds of years ago by the Spaniards. 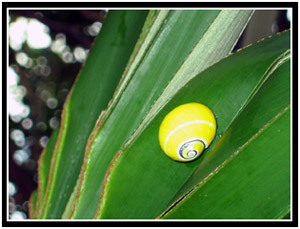 And if you keep your eyes open, you might even see some of the (now rare) Polymitas the most colorful, pastel-colored snails you’ve ever seen – living among the foliage. 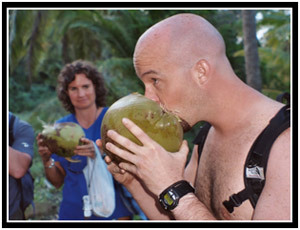 And if you do get a guide, your excursion is likely to be topped off with a welcome offering of coconut milk served in the shell… with a fresh lime squeezed right in. An amazingly tasty combination. 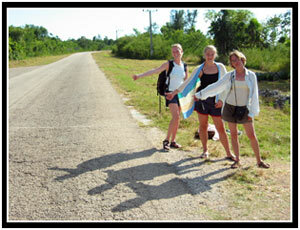 Baracoa had many other things worth doing that I didn’t find the time for in the five or six days we stayed there. It seems like a sleepy little town with lots to do outdoors – I could have easily stayed there a full month. But hey, if you’re not up for rest and relaxation on your vacations, Baracoa can still be a good place for the dance-all-night type — just plan your vacation around New Year’s. The fiesta atmosphere was in full effect as, for almost an entire week, there was a full-on street party every night. I’ve met a couple people who have been to Santiago and didn’t like it at all. I spent just two days in the bustling city, but came away with the impression of many things to do and see. If a busy, crowded city drives you nuts, you might want to skip Santiago, but you should realize that, at the very least, you’ll at least be missing some awesome music! 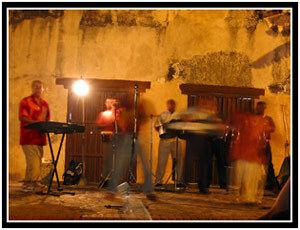 Each night I was there, I paid $3 at La Casa de la Trova to listen to live music. Downstairs has a small room, open to the street and a courtyard in back where musicians can set up. These shows typically start around 8pm or so and with an entrance fee of only $1, you’ll have money left over for drinks. Around 9:30pm, they’ll open the doors for the show upstairs. Line up a little early to pay your $3 so you can get in early for the best seats. …to get to La Casa de Tradiciones before it closes down for the night. 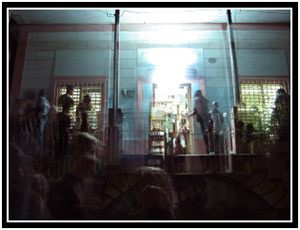 La Casa de Tradiciones is a small, trendy place packed wall-to-wall with people socializing and dancing to a live band (or dance music played closer to closing.) There are plenty of chairs spaced around the perimeter walls (for people like me, who don’t dance) and a bar in the middle where you can get something to drink. In the back is a courtyard where we happened upon an amazing cellist accompanied by his sister, a very talented singer. 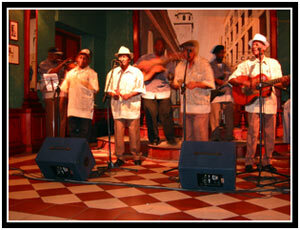 Tradiciones is the trendier place by far, catering to the young Cuban crowd more so than the tourist-inundated Trova. Okay, that’s the nightlife, but what’s to do during the day? 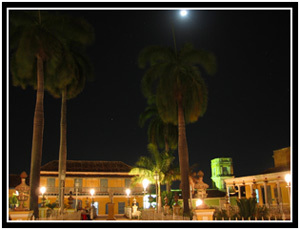 Plaza Céspedes is the center of town, but for the most part you’ll probably want to stay away. It’s not that there isn’t anything to see around there, it’s just that the hustlers are out in force. It’s quite impossible to sit in the plaza for more than five minutes without being asked for something. Normally this kind of behavior doesn’t bother me too much – it goes with being a tourist – but it’s especially taxing in the heart of Santiago. Come to think of it, though, there may be a good reason or two to work your way to the center of town. There’s a hotel on one corner of the Plaza Céspedes that has a nice restaurant on the roof. From there you can gain a fantastic view of the surrounding city and bay and, unlike the view from El Balcón de Velázquez (mentioned in our guidebook), there’s no security guard to demand a one dollar tax for whipping out your camera. Also, just one street off the plaza is a barber shop that does an amazing job with cranial and facial hair. I walked in and simply asked, “¿Puede afeitarme la cabeza?” and before I knew it, I was receiving a spa-worthy treatment. After an hour of attention and a pay-what-you-think-it-was-worth plan, I left for the park to write down everything that had happened. I came up with 18 different steps, including such luxuries as a mud facial, goatee shampooing, hot-towel wrap, and even a facial massage. Truly the best shave I’ve had in my entire life! There are great opportunities for day trips outside the city of Santiago, too. Not too far down the coast is a Moorish fort standing guard over the entrance to the bay. While I didn’t have time to venture inside, we did come within site of it when embarking on a ferry ride to Cayo Granma – an inhabited island in the middle of the bay with a distinct Mediterranean look. The ferry to Cayo Granma only sets you back $1 before turning you loose to spend the afternoon walking around the island. That’s all the time you’ll need, too, because the island is quite small. In just a few hours we found time to walk the entire island, stop and visit at an elementary school, climb to the church on top of the hill, and search the shores for some rather nice seashells. I don’t believe there are any restaurants on Cayo Granma, but that doesn’t deter a booming dinner business. Trust me; it won’t be long before you find yourself attached to a self-appointed guide, and if they don’t offer to take you someplace for food, you’re definitely doing something wrong. I’m sure there are many more things to do in a city the size of Santiago, but we just didn’t have much time before our scheduled flight back to Havana. Some regrets: We tried to catch a baseball game in a fancy-looking stadium, but walked in just as the last pitch was thrown. I also eyed the Copellia ice-cream park next to our apartment building each night when it opened, but it was always so crowded that we never took the effort to wait in line. Also, because it was the weekend, we were forced to skip a bunch of noteworthy museums that were closed. Así es la vida… at least now I have something to go back for. 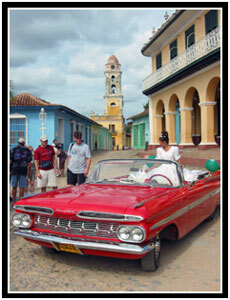 There you have it – my rundown of things to do in Cuba. Obviously there are literally thousands of other, worthy attractions, but I can only tell you what I’ve done myself. The long and the short of it is that you will not run out of things to do on the island and if you manage to get bored, you have only yourself to blame!